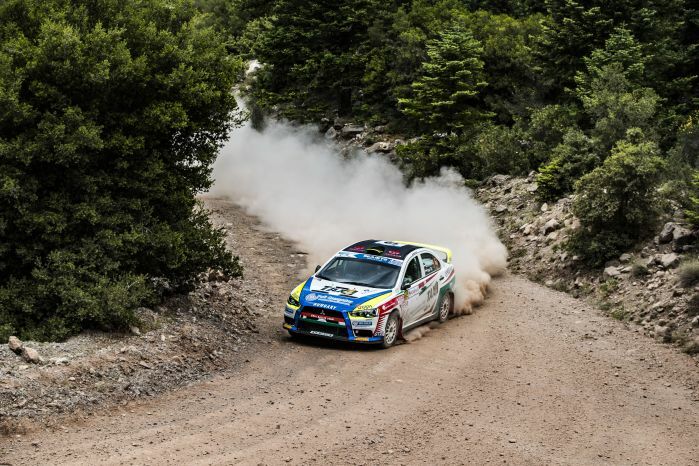 Tibor Érdi Jr continues to lead the FIA European Rally Championship’s ERC2 category on the EKO Acropolis Rally, increasing his gap over Juan Carlos Alonso thanks to two quick runs through both Drossohori tests. Running his familiar Mitsubishi Lancer Evolution X, Érdi Jr mastered the difficult balance between speed and caution against damage from Drossohori’s rough surface. He gained 36.0s over Alonso with his two stage wins, though Alonso clawed a combined 9.9s back through both passes of Paleohori-Mendenitsa. Alonso is now 51.1s seconds behind Érdi in his near-identical Lancer with four stages remaining. Sergei Remennik holds the final podium position in ERC2 despite hitting a rock and picking up a puncture in Drossohori’s morning pass. His place was under threat immediately afterwards from Q8 Oils Rally Team driver Petros Panteli, who was a mere 0.2s behind Remennik after SS4. His hopes of a podium finish were set back by a fuel pump problem late on Saturday afternoon. He still holds fourth place, but has now fallen back to 16.9s behind Remennik, who also suffered a puncture during SS5. Melegari had not been far behind that podium battle, but he too suffered a fuel pump problem, this time in SS6. He was forced to stop mid-stage, dropping eight minutes in the process and staying fifth. Vassilis Drymoussis had hoped to restart after his retirement late on Friday, but did not make it out on Saturday. What’s next? Sunday’s final leg features four all-gravel stages over a competitive distance of 81 kilometres. The action begins with the EKO Grameni run, which covers 21.97 kilometres and gets underway at 09h58 local time.